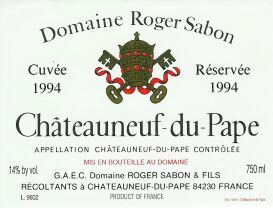 Long regarded as a reference point for this magnificent appellation of world renown, Roger Sabon is a great source of traditional Châteauneuf-du-Pape where the expression of fruit and terroir is everything and oak is treated with caution. Sabon makes wines of concentration, flesh and finesse utilising foudrés, concrete and second use barriques for elevage. Sabon’s Châteauneuf’s typically benefit from medium term cellaring, from four years for the ‘Olivets’ up to ten years for the ‘Prestige’ and ‘Secret’. In exceptional vintages they produce the exclusive, rare and expensive ‘Le Secret Des Sabon’ which is a hedonistic and extraordinary wine; less than 1000 bottles are produced in any given vintage. “One of the irrefutable reference point estates of Châteauneuf du Pape for traditionally made wines. There are four cuvées of Châteauneuf du Pape produced, although admittedly the 150 or so cases of the Le Secret de Sabon are virtually impossible to find, which is rather sad given that it is one of the greatest wines produced in the world. The 2004s are a success at Sabon, and my instincts suggest they are probably superior to the 2003s and the best vintage Sabon has turned out since 1998 and 2001.” Robert Parker Jnr. “A fantastic estate that covers close to 44 acres throughout the appellation, Domaine Roger Sabon was created by Roger Sabon in 1952. The estate was taken over by Roger’s sons (Jean-Jacques, Denis and Gilbert) in 1976, and since 2001, the wines are made by Didier Negron, who is Jean-Jacques’ son-in-law. The estate produces upward of four red Chateauneufs in a given vintage and one white. In addition, they release a solid Cotes du Rhone and Lirac.” Robert Parker Jnr. This is a seriously interesting and complex blend of Grenache and Syrah with a splash of Mourvedre this is briary, dark-fruited and lush, beautifully contained within its velvety mouthfeel and structured finish. 60 yo vines. The Réservée with its slightly darker color shows more complexity with the earthy dried herb and introduction of tar ramping up the scale. The silky and richly black fruited palate is densely packed with dark fruit flavors, anise and tar and exotic herbs. A powerful and fleshy wine which has a very fine long finish. 2/3 foudrés, 1/3 barrique (no new). From some of the oldest vines on the estate, they are eighty years old. Explosive with massive black berry intensity, tar, anise and some hints of prune. For a wine of such ripeness and power the palate is amazingly fresh; it follows that the flavor zone is in the blue berry and black berry zone, there’s more tannin in this cuvee although it shares a similarly velvety structure with Réservée. This is nothing short of brilliant, deserving of a dozen years in the cellar. 2/3 foudrés, 1/3 barrique (no new). ‘An extremely limited cuvee of around 2,000 bottles, the Chateauneuf du Pape Le Secret du Sabon is, year in and year out, one of the top ten Chateauneuf du Papes produced. From vines well over 100 years old, mostly from the sector of Chateauneuf du Pape known as La Crau, Jean-Jacques Sabon is not sure what the actual blend is, although it is mostly Grenache, because at the time of the original planting it was common practice to mix in many different varietals. ‘ Robert Parker Jnr.